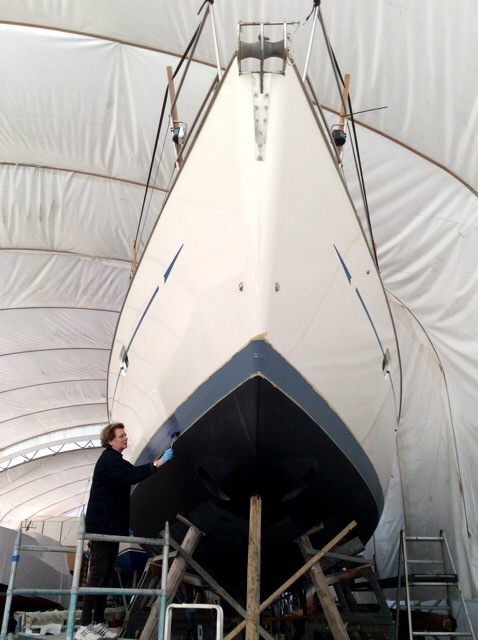 With Raya scheduled to go back into the water next week it’s all hands on deck to get everything near or below the waterline finished. Rick and I grabbed the small weather window at the beginning of the week, of slightly warmer conditions, to paint the boot tops. Slightly warmer is the key phrase, I was wearing a full set of thermals, a T shirt, a jumper and two fleeces, yet was still freezing by the end of each day. Fortunately it was just warm enough for the paint to dry, one more job done. Boot Tops is a new word for me – I had to look it up!